Products May Be Made To Order: Lead Times May Apply. Guard Dog® general purpose Cable & Hose Protectors are a quick and easy way to guard and protect valuable electrical cables and hose lines from damage and abuse while providing a method of safe crossing for constant vehicle and pedestrian traffic. Each cable/hose line is separated and organized in its own protective channel to ensure safety. 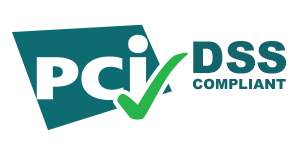 Ideal for use in amusement parks, entertainment venues, sporting events, and in most public, commercial, industrial, construction, and utility applications. Guard Dog heavy duty cable ramps combine exceptional cable protection with a convenient portable design to give you optimal peace of mind. Guard Dog cable covers are also available in extra low profile options to adhere to ADA accessibility guidelines allowing you to offer a safe and inclusive work/event space for all patrons. These cord covers also offer top loading accessibility allowing for impressive ease of use in addition to their inclusivity. 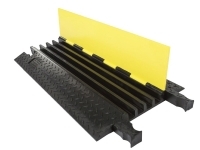 Make no mistake however as these cord ramps do not compromise durability for their convenience or inclusivity properties as evidenced by their sturdy polyurethane construction. You can rest assured that Guard Dog cable protectors will stand tough against whatever environmental strains you need them to. 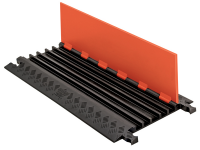 Furthermore, Guard Dog wire ramps are available in 3 and 5 channel options to accommodate a wide variety of cable management needs. Check out our Guard Dog Low Profile cable protectors are ideal for Military, industrial, and event cable protection applications. 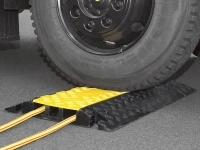 GUARD DOG® 5-CHANNEL ADA CABLE PROTECTOR has built-in ADA accessibility ramps to provide a safe crossing for vehicle and pedestrian traffic while protecting valuable electrical cables and hose lines. Because the ramps are built-in, there is no need for separate connectors. 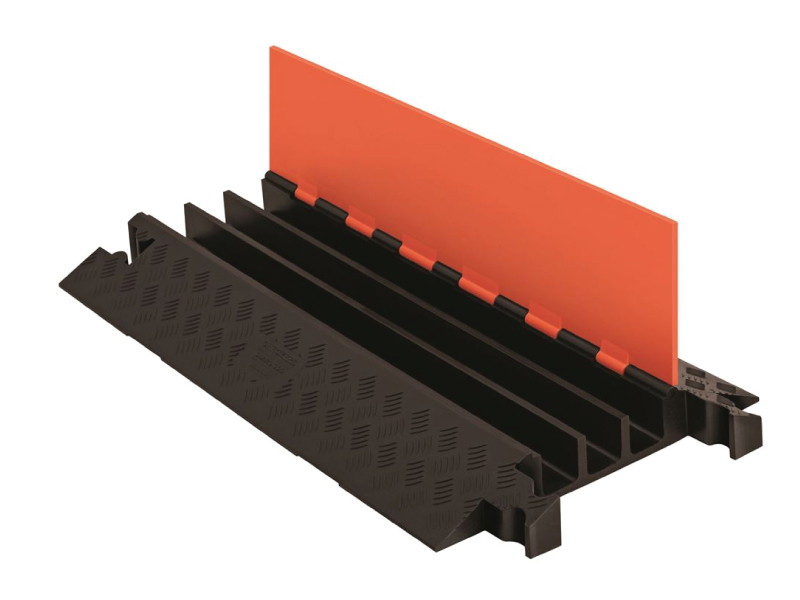 Another unique feature of this product is that it interconnects directly to a 5-channel standard ramp Guard Dog cable protector. This modular interlocking design is available in lightweight 18″ sections and it includes a recessed carrying handle on the underside of the protector. Ideal for use in amusement parks, entertainment venues, sporting events, and most public, commercial, industrial, construction, and utility applications. Our range of guard dog cable protectors are an effective solution for all your cable protection needs. 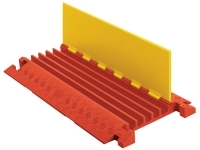 Manufactured with durable polyurethane and in line with NEC standards, our range of general purpose guard dog cable protectors have a high load bearing capacity of 21,000 lbs per axle. This makes them suitable for a variety of industrial, commercial and public applications including festivals, parks, schools, playgrounds, factories, office buildings, parking areas etc. With their dog bone connectors and end points, the guard dog cable covers can be used for long-term indoor and outdoor cable coverage. General purpose guard dog cable protectors are a fast and efficient way of protecting valuable cables and hose lines from abuse or damage. They also enable pedestrian and vehicular traffic to cross safely, including handicapped people. For pedestrians and handicapped people, guard dog cord covers provide maximum support and floor grip in accordance with federal and state safety guidelines. Why You Should Use Guard Dog Cord Covers? The general purpose guard dog cable covers are available in 3 channel and 5 channel varieties. These products can withstand temperatures ranging from -40° F to 120° F (-40° C to 48° C). They also come with a hinge pin which is manufactured with reinforced fiberglass to reduce chances of breakage or damage. The 5-channel range has a load bearing capacity of 10,500 lbs. (4,763 kg) per tire and 21,000 lbs. (9,526 kg) per Axle. The 3 channel has a load capacity of 14,210 lbs. (6,446 kg) per tire and 28,420 lbs. (12,892 kg) per Axle. Guard dog cord covers can be used in different areas, including the following areas. The functionality of guard dog cable covers increases when the surface is smooth and free of bumps or holes. Before placement or installation, make sure to prepare the surface by removing any bumps and filling in holes. Mark the placement position on the surface and connect all tools and pieces according to instructions. Join the female side of guard dog cord covers on top of male side. After joining, press both sides downward until they fit into the connecting ends. Secure the ends. For permanent installation, drill holes in the ground and secure the guard dog cable covers with nails. Insert the cables one by one into the channels. The cables may stick to each other if you overload the channels. Make sure that the lid can be easily closed without using pressure. Also, secure the lid with grip tape to reduce chances of flip-back. Ask our representative about purchasing connector ends with your chosen guard dog cable covers. When closing the lid, the cables should always be secured with connectors ends. Make sure that you correctly identify the estimated traffic load when selecting the guard dog cord covers.